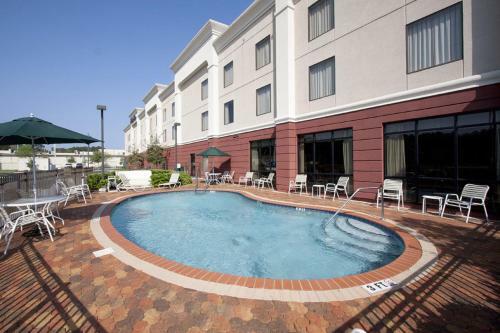 An outdoor pool a sunny terrace a barbecue area: the Hampton Inn Jacksonville I-10 knows what you want when you're on the road. Add to the list a free breakfast buffet internet access and private parking. Start your day with the breakfast buffet at the three-story Hampton Inn. Biscuits and gravy are a favorite dish among guests as are scrambled eggs and bacon. There are plenty of hot and cold options as well as lots of coffee. (You can also pour yourself a cup any time of day in the lobby.) If there's no time for breakfast the staff will pack a bag of tasty treats. The outdoor pool is a beauty and it's right by a shaded barbecue area that's perfect for picnics. Cardio equipment and a video monitor are on hand in the fitness room. The 82 rooms pamper you with pillowtop mattresses and TVs with premium cable channels on-demand movies and video games. With free internet access you can transform the spacious work area into your private office. Parking is free. 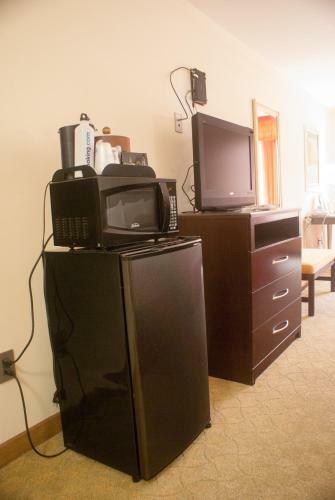 Off I-10 the Hampton Inn is a 20-minute drive west of downtown Jacksonville. The Jacksonville Maritime Museum and the Museum of Science and History are both 12 miles east. Everbank Field home of the Jacksonville Jaguars is 14 miles east. When it's time to catch a flight Jacksonville International Airport is 21 miles northeast.